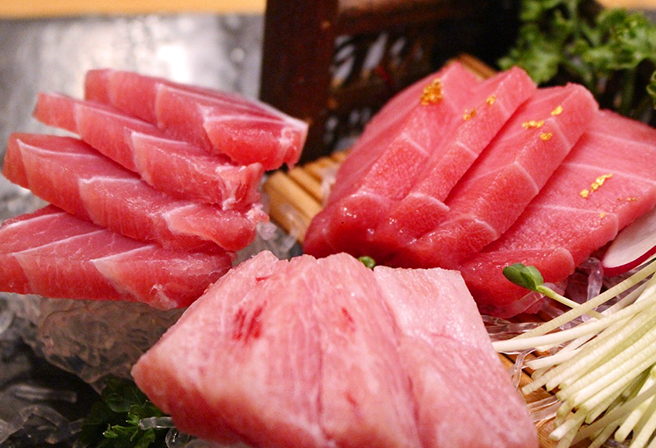 Come Taste Tuna, the King of Fish! Colorful tropical fish in reds and blues spring to mind when we talk of fish in Okinawa, but in reality, tuna is the fish most commonly harvested here. Tuna is a fish which rides the oceans currents to migrate thousands upon thousands of kilometres across the wide ocean. When it is time to lay their eggs, tuna prefer a warm ocean and seem to gather naturally in the oceans nearby Okinawa, from the larger varieties such as the Bluefin tuna which can weigh up to nearly 300 kilos, to smaller types such as yellowfin and big eye tuna. Although tuna is fatter and tastier during spawning season, the timing varies for different species and so fresh, seasonal tuna can be eaten in Okinawa all year round. Bluefin and yellowfin tuna also make for high quality sushi during their spawning season which lasts from early spring to July. We recommend visiting the Churaumi Aquarium if you would like to see the tuna swimming, or head over to Tomari Iyumachi Fish Market in Naha to see them being sold at auction where professional traders as well as the general public can buy fish. If timed right, it is also possible to observe the tuna being filleted through glass walls. It is a fantastic sight to see the tuna freshly caught that day all lined up in rows. Of course it is also possible to enjoy tuna dishes in the market for a reasonable price, so please do!